It’s official! 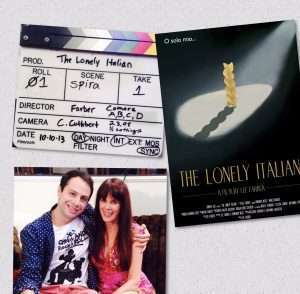 The film, The Lonely Italian has been released and you can watch it now! It’s a hilarious movie, and I’m honored to have been the star’s online dating experts and coach. Watch early on as I help the lonely Italian Domenico Nesci navigate the waters of online dating and mobile dating apps. You name it, he’s tried it! The film has already won two festival awards for Best Comedy Film in the San Diego International Film Festival and Best Film-USA in the Ferrara Film Festival. Here’s a sneak peek at my dating coaching session on the first day of shooting. From JDate to Tinder, 420 Dating to Fitness Singles, Domineco leaves no dating opportunity off the table. Here’s the film trailer and it will have you ROTFL. You can download the film digitally on your tablet or TV through Amazon, iTunes and more. Click here to purchase or rent the movie. Julie Spira is America’s Top Online Dating Expert and Digital Matchmaker. She’s an award-winning dating coach and CEO of Cyber-Dating Expert, where she’s been helping singles find love online for over 20 years.